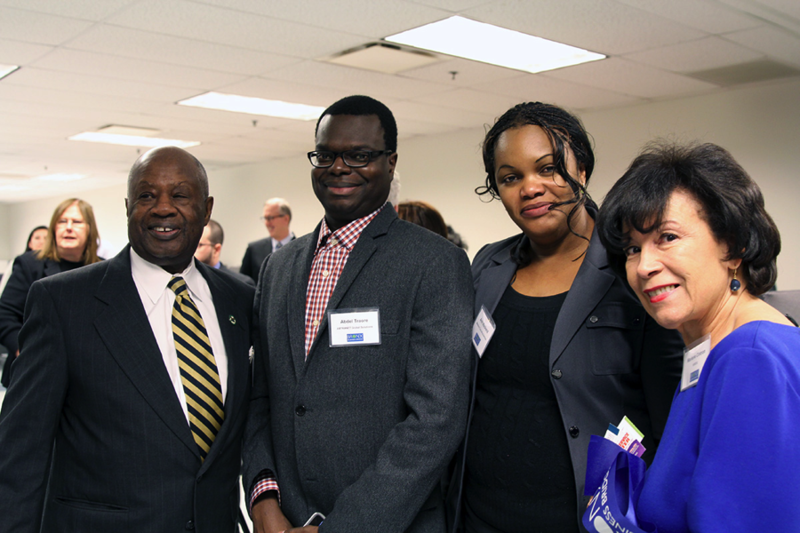 Abdel Traore, second from left, launched his African exportation business Abtranet Global Solutions, LLC in the Bronx Business Bridge Incubator at the incubator’s opening in February. Also pictured are Clarence Stanley, director of the Bronx Small Business Development Center, Ann Mackend, another entrepreneur at the incubator and Marlene Cintron, president of the Bronx Overall Economic Development Corporation. Abdel Traore is a father of two who studies literature part-time at Lehman College. He works full time in a Bronx hospital’s IT department, and he’s lived in the city for over 20 years. Without his thick accent, Traore, 40, might pass as another native New Yorker who runs a new tech startup on the side. But Traore has built his business around knowing what everyday people an ocean away are buying. A Mali native, Traore realized he had a pulse on the markets of his homeland and surrounding countries. So he started Abtranet Global Solutions to gather new and used electronics, medical supplies, computers and cellphones from the U.S. and export them to Africa. Traore said he sees firsthand something the average American doesn’t: Africa’s middle class is booming. One in three Africans are now in the middle class, and that number is set to grow to almost one in two by 2060, reports the African Development Bank. What sparked the idea for your company? I knew the market because I’ve grown up in Africa, and when I was there I was hungry for U.S.-made products myself. Computers that you recycle here are very valuable in Africa. Instead of people dumping them, they can just give it to us and we can update it and send it back to Africa. Your business spans two continents. Why do you choose to keep your business in the U.S.? I feel that American companies are ignoring the fact that Africa is booming. I believe that Africa is finally catching up to the world economy. And I feel the U.S. is probably the best place in the world to do business. Right now I am on the phone all day with retailers in Africa. And everyone wishes they could establish a business here. Here you can grow your business 100 fold. Access to capital. I know the demand is there, it’s just that I cannot sustain the demand without more capital. It’s a waiting game. I ship and then I have to wait for it to be sold. The big money is in volume. I have been shipping already, but at a very low quantity. From July to now I’ve probably exported about $35,000 worth of merchandise. If I were to load a container worth $50,000, I could probably get $100,000 for it. Did you always want to be an entrepreneur growing up? To tell you the truth I wanted to be a lawyer growing up. I went to school for pre-law in South Africa and then came to the U.S. on a student visa in 1996. But when I got here I couldn’t afford to go to law school, so I veered to IT. Could you have ever dreamed you’d be starting a business in the Bronx when you were little? I never thought I’d live in New York. The stereotype of the Bronx back home was that it was a very unsafe area. We heard that from newspapers and films. But when I first moved here, I could not afford to live anywhere besides the Bronx. Now there are so many opportunities in the Bronx. Compared to Manhattan, the Bronx is still a very undeveloped area. What made you stay in the U.S. after first coming? I came, I saw the opportunity and I stayed. When you come from anywhere in Africa, you see that there are so many opportunities here. Everything here seems better. I thought that if I stayed I could just work hard and make it. But it’s been a very long struggle because I was never able to go back to school. That’s why I’m taking classes at Lehman College. I’m still trying to achieve that dream. The area around Lehman is estimated to have one of the highest populations of West Africans outside of West Africa. Is the entrepreneur path typical within the African immigrant community in the Bronx? Most people in our community are forced to become entrepreneurs because of the language barrier or discrimination they face. But because they don’t have access to capital, you also have to have a part-time or full-time job to pay the bills. How do you see your business growing in the future? Right now I have exported to Mali, Senegal, Sierra Leone, Mozambique and Ghana. But my goal is eventually to be in all of Africa. I’d also like to start importing agribusiness products from Africa to the U.S. Peanuts from Senegal, cotton from Mali, shea butter. Being an entrepreneur involves a lot of risk and a lot of effort. What keeps you motivated to do it? It’s the motivation to come to America. You don’t just want to come to America and leave your entire family behind just to come work for somebody. You want to reach back and help your own country. You want to start your own business and achieve the American dream. Africa’s middle class is growing, said the latest report from the African Development Bank. The report was originally released in 2011, but its statistics were re-confirmed in a 2014 report by the organization. “It’s probably the fastest growing consumer class in the world, as a region,” Michael Lalor, director of Ernst & Young’s Africa Business Center in Johannesburg told Reuters in 2013. But despite the consensus that income levels have grown in the continent in recent years, the African Development Bank’s findings have also sparked some controversy about how to define a middle class. The study classified middle-class Africans as those who spend between $2-20 USD a day. This figure includes what the bank calls a “floating class” – Africans who spend between $2-4 a day. The report states that about 60 percent of Africa’s middle class falls into this category, which is barely above what is considered the international poverty line of $2 a day. Yaw Nyarko, director of the Center for Technology and Development at NYU, said that even though a dollar goes further in these economies, Africans who make that little are in danger of “floating” back into poverty. “The African Development Bank’s definition of middle class is set at a very low bar – one that most Americans would consider poverty,” Nyarko said in an email. But the study also argues that this “floating class” has grown since 1980 and has increasing significance. “This category is crucial because it is a hinge between the poor and lower middle class category. This class is vulnerable and unstable, but it reflects the direction of change in population structure through time,” the report stated.